Nicolas Provost’s work reflects on the grammar of cinema, the human condition in our collective film memory and the relation between visual art and the cinematic experience. His films provoke both recognition and alienation, and succeed in catching our expectations in an unraveling game of mystery and abstraction. With manipulations of time, codes and form, cinematographic and narrative language is analyzed, accents are shifted and new stories are told. Nicolas Provost (born in Ronse, Belgium) lives and works in Brussels following 10 years in Norway. His films have been exhibited worldwide and have earned awards and screenings at prestigious festivals including the Sundance Film Festival, Venice Film Festival, Berlinale, San Sebastian Film Festival and Locarno Film Festival. 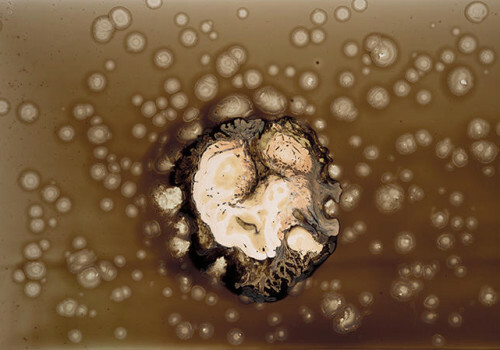 Solo exhibitions include The Seattle Art Museum; Musée d’art moderne et contemporain, Strasbourg, France; Tim Van Laere Gallery, Antwerp, Belgium; and Haunch of Venison, London. 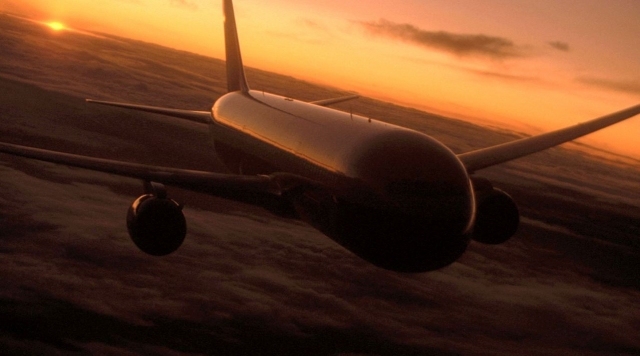 His award-winning first feature film The Invader had its world premiere at the Venice Film Festival 2011. 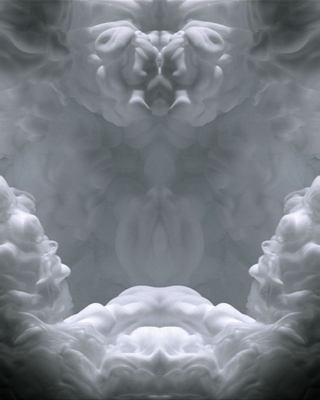 Nicolas Provost, Stardust, 2010, Video projection with sound, 240 in. Courtesy of Tim Van Laere Gallery, Antwerp and Haunch of Venison, London. 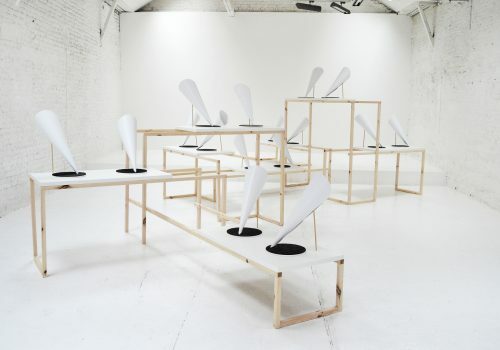 Nicolas Provost, Suspension, 2007, Video projection with sound, 48 in. 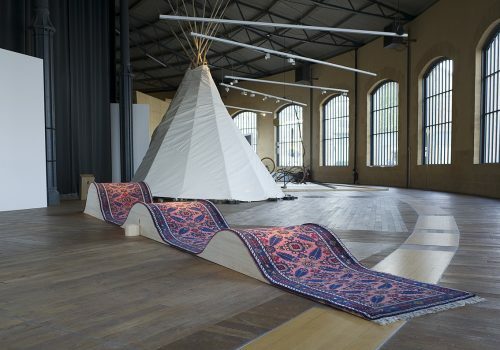 Courtesy of Tim Van Laere Gallery, Antwerp and Haunch of Venison, London. 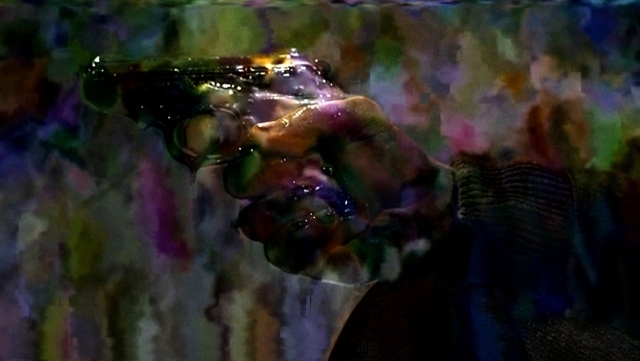 Nicolas Provost, Long Live the New Flesh, 2009, Video projection with sound. Courtesy of Tim Van Laere Gallery, Antwerp and Haunch of Venison, London. 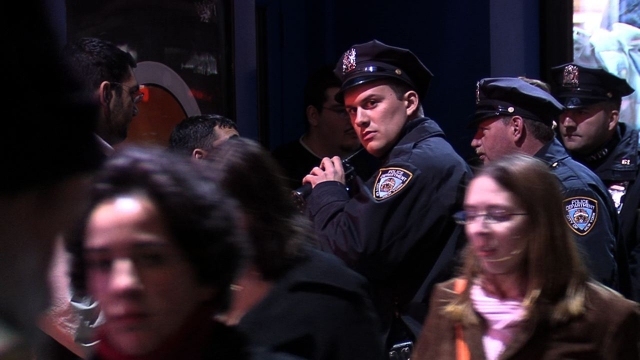 Nicolas Provost, Plot Point, 2007, Video projection with sound, 180 in. Nicolas Provost, Moving Stories, 2011, Video projection with sound, 84 in. Courtesy of Tim Van Laere Gallery, Antwerp and Haunch of Venison, London. 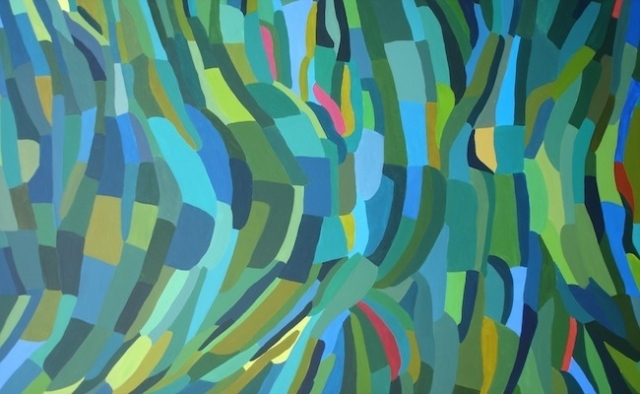 Constanza Levine has devoted her practice to investigating color on bi-dimensional surfaces. Although she has been experimenting with volume, the genesis of her work comes from the observation of the movement of large bodies of water and how reflections result in fragments and geometrical shapes. She has filtered her whole life into shapes and colors, where not only her emotions, but also whatever catches her eye undergo the same process of categorization. 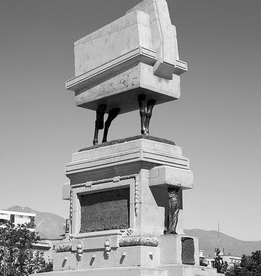 Constanza Levine graduated from Universidad Finis Terrae as a Visual Artist in 1996. 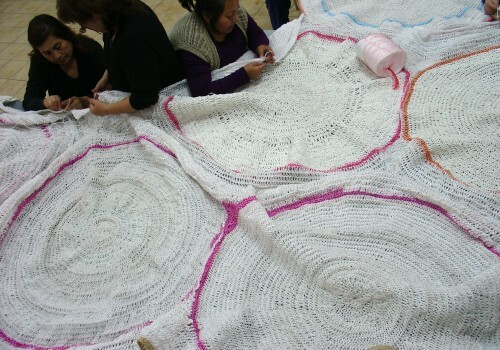 She has had two solo exhibitions: Mi Color at Universidad de Los Andes, Santiago, 2005 and Mares y demases at Teatro de Zapallar, Valparaíso, 2008. 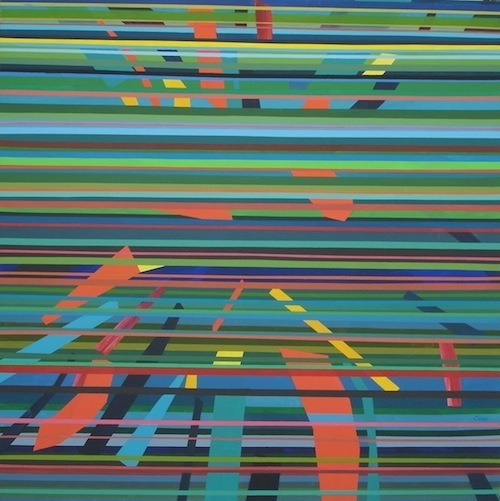 Constanza Levine, Air View, 2005, Acrylic on wood, 36 × 52 in. (91.44 × 132.08 cm). 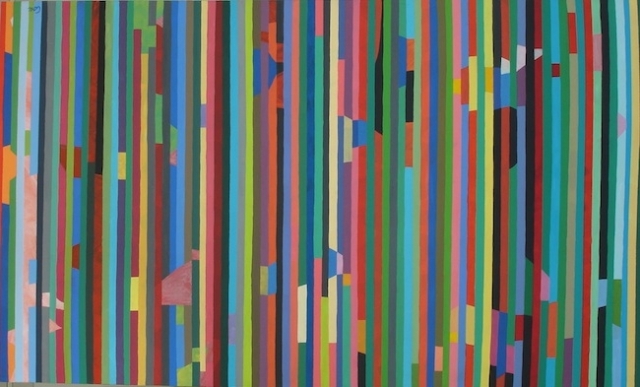 Constanza Levine, Horizontalism, 2005, Acrylic on canvas, 40 × 40 in. 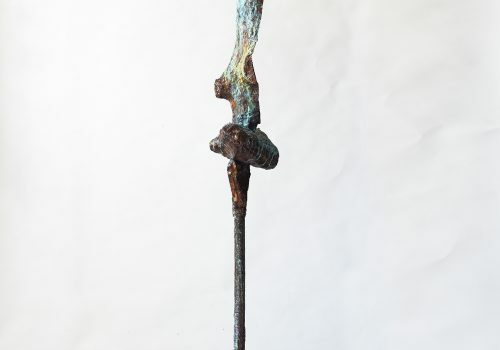 (101.6 × 101.6 cm). 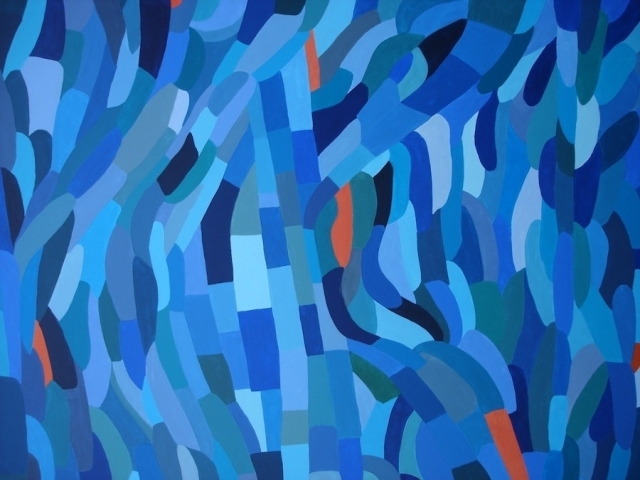 Constanza Levine, Sea Depth, 2006, Acrylic on wood, 36 × 52 in. (91.44 × 132.08 cm). 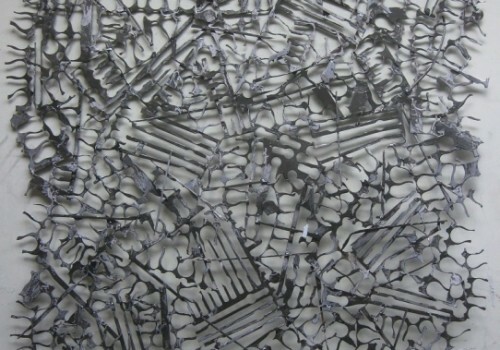 Constanza Levine, Electrossa, 2005, Acrylic on canvas, 31 × 60 in. (78.74 × 152.4 cm). Ambie Abaño’s shift from painting to printmaking brought her to an exploration of the medium as she investigates portraiture in relation to both material and process. From two-dimensional prints, her experimental works led to the creation of portraits and figures in sculpture, mixed media works, and installations, always with an element of traditional printmaking processes. Ambie Abaño (born Manila 1967) abandoned the practice of architecture in favor of being a visual artist. She exhibits widely in the Philippines and across Asia. Abaño is a faculty member at the University of the Philippines College of Fine Arts. For the past six years, she served as president of the Philippine Association of Printmakers and remains active in their training program. Her solo exhibitions include: SurFACE (2011); Sanctuaire des memoires (2012) at the Alliance Francaise de Manille, and TransFIGURATION at the Cultural Center of the Philippines (2006). She participated in A/P: Analog Playground, Ateneo Art Gallery, Manila; The Speaking House, Kerala, India (2012); Asian International Art Exhibition (2007-2011), and Open Studios at Cité Internationale des Arts, Paris (2011). 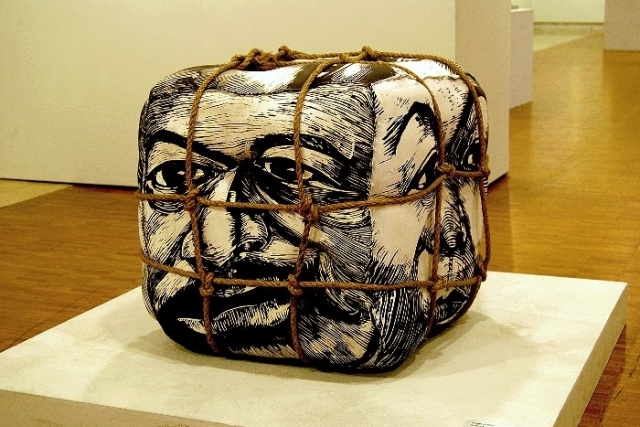 Ambie Abaño, Trapped, 2009, Stuffed prints on textile, 24 × 24 × 24 in. (60.96 × 60.96 × 60.96 cm). 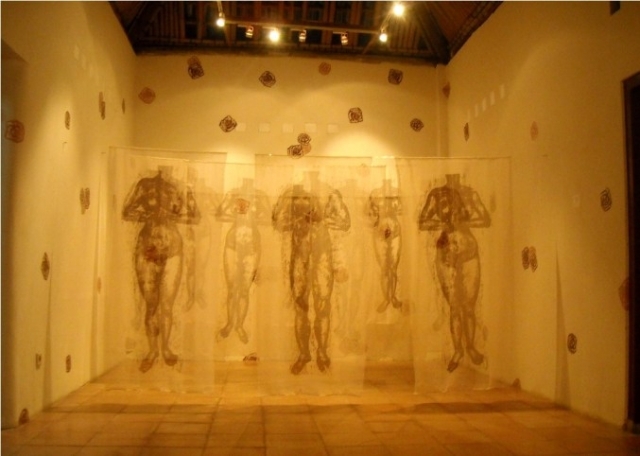 Ambie Abaño, Prayer, 2009, Installation with woodcut on textile and plastic. 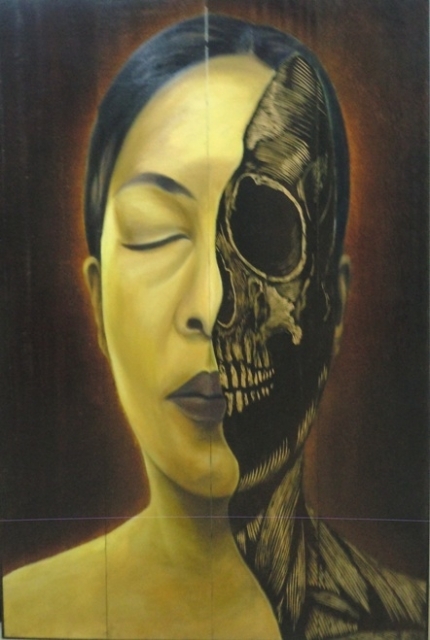 Ambie Abaño, Self Awareness, 2011, Oil painting and woodcut on phillippine mahogany, 72 × 60 in. (182.88 × 152.4 cm). 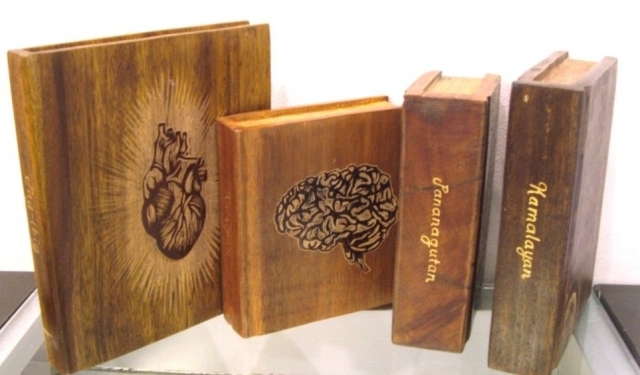 Ambie Abaño, Diaries, 2010, Woodcut on recycled wood carved into books.